We see “sevens” everywhere in nature and thus we reflect the way we describe our world. and the seven notes of the musical scale. (as I described in the Strength Card of the Tarot). made up of two tetra chords. This seven tone has a subtle influence on everyone in their daily lives. joy or love of another. Unfortunately this perspective does not take into account it’s origins of purpose. ~ into a perfected Being). the pursuit of being a better person. undiscovered aspects of the physical world. and the universe we live in. which required colorful metaphor in ancient times. to describe which is still hard to fathom. without changing its basic attributes. from the days of ancient Chaldea and Babylon. and the Moon or Luna. concerning their representation of primary forces. as higher frequencies of already acknowledged influences). and their relation to the natural world. (disputed by those familiar with ancient Celtic polytheism and mythology. than with the “Fairy Faith” as it is known in traditional Gaelic cultures. of those who live a path in life seek to be in touch with the Faery realm. (The Heptagram) as their symbol. so they may recognize each other. Over the years other Traditions have adopted the concept and symbol. to the point where annual convocations are often referred to as “Family Gatherings”. and expression of many kinds are encouraged. crossing cultures, generations, arts and sciences. The Heptagram means many things to many people. with a woven seven point star in filigree. A top bail with a jump ring offers a sleek comfortable wearing of the amulet. 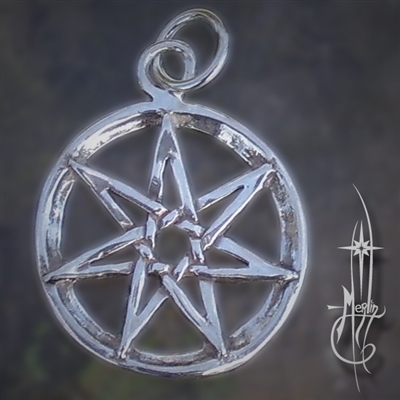 please visit the The Heptagram Amulet page.